We are some of the biggest Star Wars lovers around. I can remember going to the drive in with my parents as a kid and seeing Star Wars. My husband has the same memories. He loves the movies more than anyone I know and I have loved seeing him share that love with our children. They love the movies and characters as well. 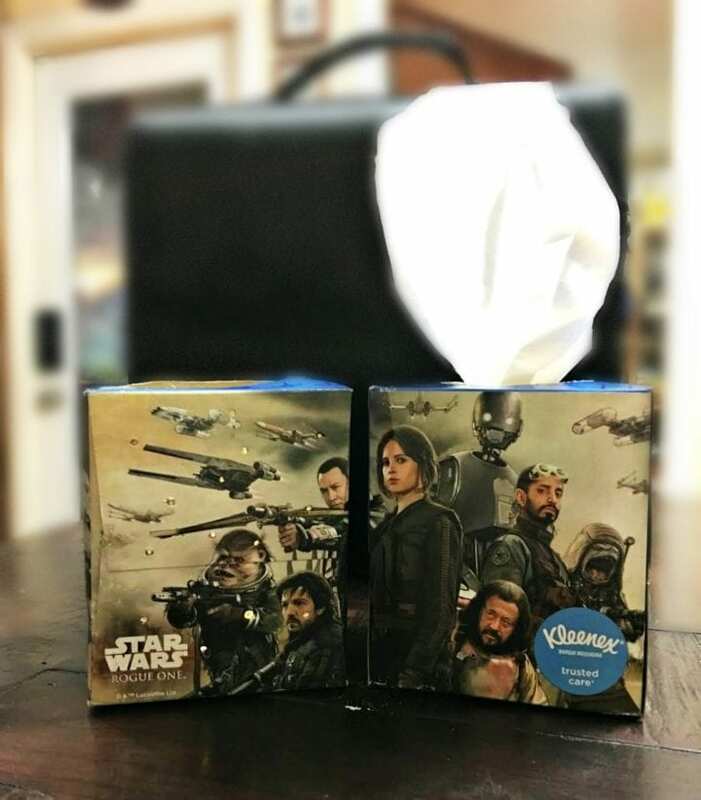 We are really excited to be partnering with the Kleenex® brand on their Rogue One: A Star Wars Story© TM Lucasfilm LTD Kleenex boxes this winter. These boxes are about the coolest things ever and the perfect way to make a creative nightlight featuring some of the beloved characters from the movie. 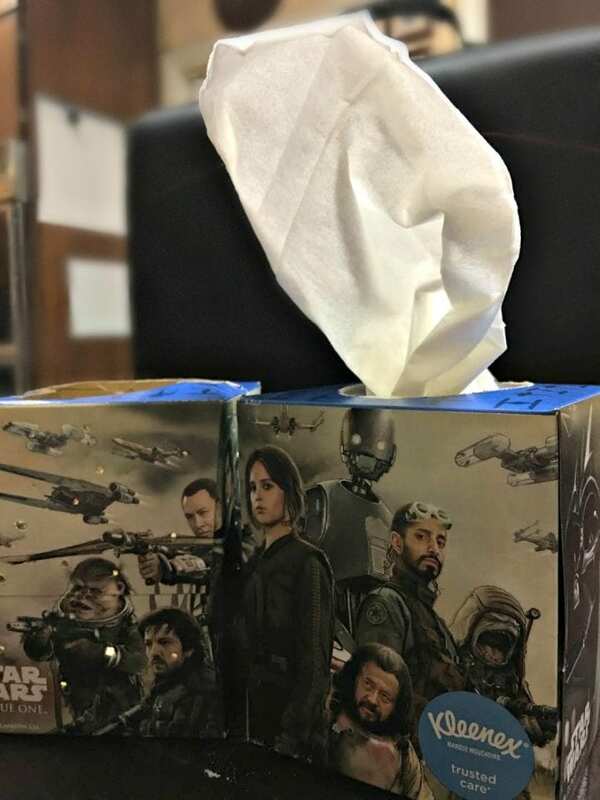 In partnership with Lucasfilm LTD, the Kleenex brand is launching these really cool limited edition boxes. Check out all of the characters. The boxes feature Rogue One: A Star Wars Story designs which is what Star Wars lovers of all ages will love! I know that I do. Jedis of all ages can grab their own Kleenex brand ft. Rogue One: A Star Wars Story designs night light. This easy, DIY craft transforms your regular Kleenex box featuring the Rogue One: A Star Wars Story designs into a really fun, themed nightlight that can be a room accessory in your home. 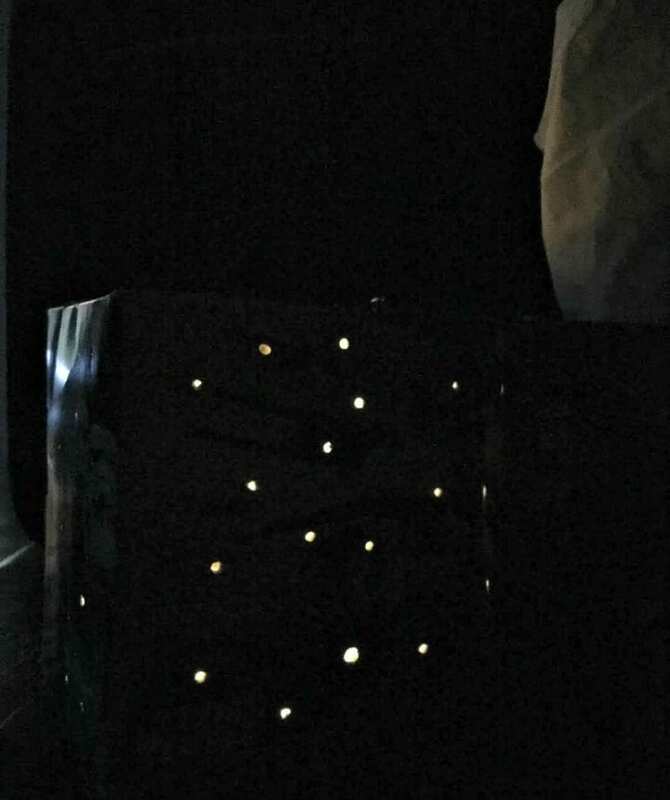 Simply remove the tissues, poke some small holes on the sides of the box (we used a large nail), then add an electric tea light or other light to create the perfect night sky in your dark room. The Rogue One: A Star Wars Story© TM Lucasfilm LTD movies features characters who are ordinary people that are tasked with doing extraordinary things. The Kleenex brand knows that we can all do the extraordinary by showing those around us that we care with gestures big and small, like sharing a Kleenex tissue. I know that in my family, spending quality time together is the easiest way that we care about one another. I love spending time with my kids and other loved ones. Now you can see some of your favorite characters on these Kleenex boxes and make a fun craft nightlight to show the stars on the wall of your room. Disclaimer: Compensation was provided by Kleenex brand via Momtrends. The opinions expressed herein are those of the author and are not indicative of the opinions of Kleenex or Momtrends. Oh, this is so cool! My family is a great fan of Star Wars. My husband and kids love watching all the movies again and again. I have to look for this tissue box. My kiddo is just getting over a cold, he would have LOVED these as his tissue box (Star Wars is his favorite movie!). I might have to buy them for the next cold LOL. I love these! I’m a huge Star Wars fan, and I’m super excited about this one. Thanks for sharing this. I can always use more Star Wars merchandise! Those are so fun! I try to always keep Kleenex in the house for fall and winter, and we love Star Wars. Gonna have to pick these up! These are awesome. My girls are super excited about Rogue One. 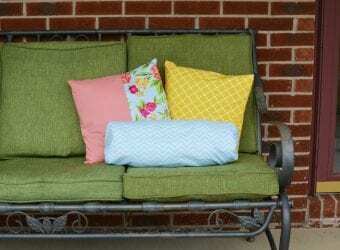 They would love to have these sitting around the house, especially since it is heading into sniffles season. Love the kiddos look. I’m sure the kiddos would love it too. Thanks for sharing. I have an old co-worker who would LOVE this. I hope he hasn’t seen it yet LOL. I’m going to go get these and mail them to him. He’ll go wild! That facial tissue is so cute! Especially when its graphic as a Star wars. My kids are so excited about this new star wars movie!! They can’t wait! I think I may grab a few boxes for the next cold that is bound to pop up and surprise them when they are feeling ill!! With cold and flu season looming, I will be stocking up on essentials including Kleenex. 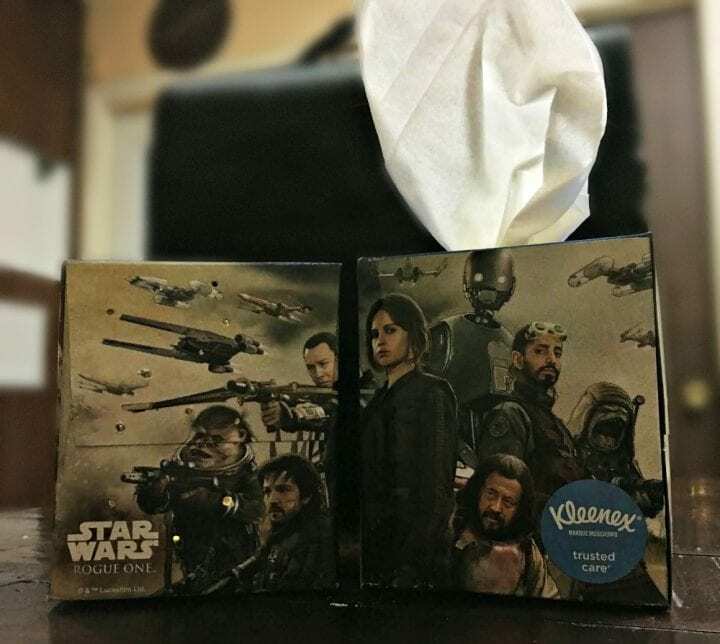 I would love to pick up some of these fun and unique Star Wars tissues. My family are huge Star Wars fans. I will have to pick up a few of these boxes of Kleenex. I love the look of them. I didn’t know Star Wars was on the Kleenex boxes. I’ll have to look for those! I like how you made a nightlight. That’s neat! TheKleeneex boxes are cool looking. I will have to see if they have some next time I am at the store. My husband would enjoy them. My son is a huge Star Wars fan. I might just have to find these for him. I love themed Kleenex boxes. They make blowing your nose so much more fun! LOL! This is a really cute idea to turn the Kleenex box with Rogue One A Star Wars Story design into a night light. I am going to have to make this for my friend who love everything about Star Wars. Thanks for shairng the idea. 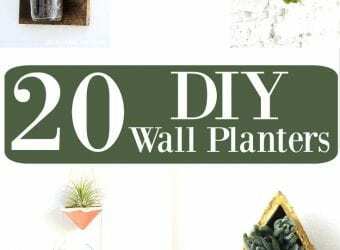 What a cool way to add a special touch to your decor. My son is a huge Star Wars fan so he totally needs these! Both my husband and my son are big Star Wars fans. And Kleenex has always been our trusted brand when it comes to tissues. Gotta love those boxes! What a fun idea! That makes a great nightlight!!! Those are fun to have I knew someone in the family who’s Star wars fanatic whom I think will appreciate it more. I love keeping Kleenex in my car and this one is fun to have! Really excited about the backstory movies in star wars. I’ve read some of the old extended universe books and really thought it was cool. These are so super cool, unlike me, who doesn’t really care for the franchise. I know, I now, I’m horrible. I really wish I did cause everyone I know loves Star Wars – I can see me stocking up on these for holiday festivities though. Omg how cute are these boxes?!?! Hubby is a total star wars fan so I will have to look for these boxes!!! 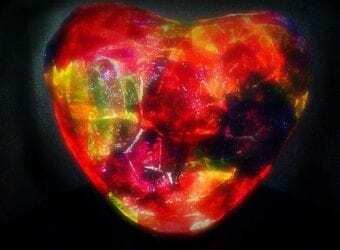 Converting it into a nightlight when you are done is a great idea!